The unemployment rate is one of my favourite indicators for measuring the level of advance of an economic cycle. 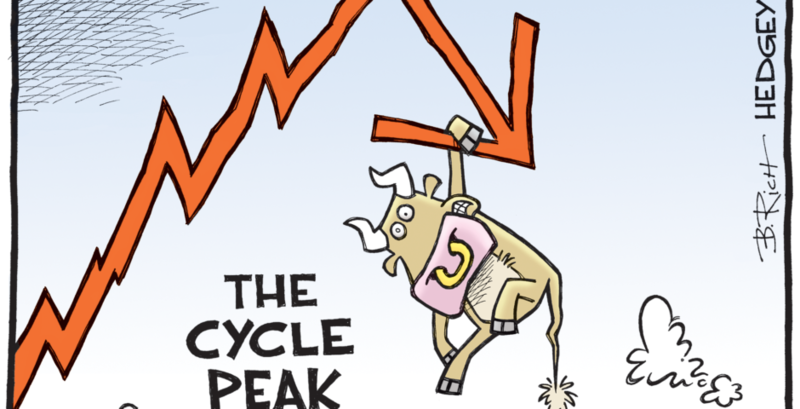 When it is high, with the risk of inflation increasing, excess of monetary restrictions or speculative bubbles are less probable and so the chance of change on the direction of the economic cycle tends to be very limited. But when the unemployment rate reaches levels that are too low, the opposite is also true. Exhibit 1 shows the minimum unemployment rates in the last six economic cycles, the dates when they took place and also the date when the S&P500 index reached its maximum. The average delay between the date of the minimum unemployment rate and the moment when the S&P500 index reaches the maximum is 6 months. The chart below also shows that the lowest unemployment rate in the last 50 years was 3.4% in 1968 and apart from that year, unemployment has never been lower than today since then. 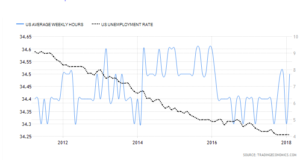 It is not difficult to guess that the current unemployment rate in the USA at 3.8% is low after having a look at Exhibit 2 below, or taking the Federal Reserve reference for Natural Rate of Unemployment into account. In this second case, the estimation is 4.2%-4.8% but as the FeD Also recognises, “the lowest level of unemployment that the economy can sustain is difficult to determine, and has probably changed over time due to changes in the composition of the labour force…” Actually, not so long ago, the Natural Rate of Unemployment for monetary policy reference was 6.25%. Nonetheless, the main questions are still the following: How much could the unemployment rate still fall or how far are we now from the minimum? Or, how long could it remain at the current levels? 2. Changes in labour participation: Activity Rate. 3. Increase in working hours per employee. 4. Decrease of unemployment rate. 11MM increase in working population vs 18MM demand in 2014-2030. From 2014 to 2030, the population in the USA is expected to increase by 12.9%, from 318 to 359 million. Nevertheless the employable pollution aged between 16 and 64 will probably grow at a considerably lower rate (5.4%) than the total population. The contrast will be even more significant as the growth of the population aged above 65 could be 61% in the same period. In absolute numbers, the population between 18-64 is expected to increase by 6MM from 2014 to 2020, and by 5MM between 2020-2030. Meanwhile, the expected demand of employees will be 18MM for the next five years if the economy continues to grow at a rate of 2.5% in real terms. As a conclusion, it can be said that to maintain the expected future economic growth, it is highly probable that a higher participation in the labour force of persons above 65 years of age will be necessary, among other factors. The effect on the Labour Force of postponing retirement by one year is an increase of 4MM employees. Changes in labour participation: The Activity Rate is expected to keep falling. The Labour Force Participation (LFP) has been decreasing since the end of the 90’s, as shown in Exhibit 5. Increase in retirement as an effect of an ageing population. The oldest ‘baby boomers’ have become eligible for Social Security retirement benefits in the last decade. Increase of educational period, as further studies are considered as a valuable advantage, due to the economic incentives associated with higher wages and better employment opportunities. Family responsibilities. 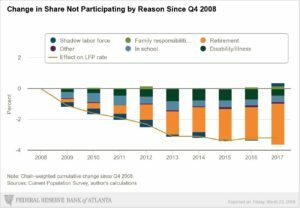 This factor is the only one that has had a positive impact on the LFP, mainly because the rate of female non-participation for family responsibility reasons has been generally declining. Shadow labour force. These are people that the Bureau of Labour Statistics do not consider as employable because they do not fulfil certain criteria, such as being available to work or seeking actively employment but are marginally attached to the labour market. The increase in the shadow labour force between 2008 and 2011 brought the labour force participation down by about 0.7%. Since then, the increase has reversed. 1. Slightly increase in LPD for lower rate of disability or illness. 2. Positive contribution of the Shadow labour force. 3. Fewer people abandoning the work force because of family responsibilities. 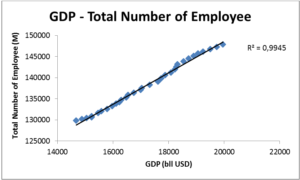 · U.S. Bureau of Labour Statistics (done in December 2015). · Congressional Budget Office (June 2017). · Daniel Aaronson and colleagues at the Federal Reserve Bank of Chicago (September 2017). 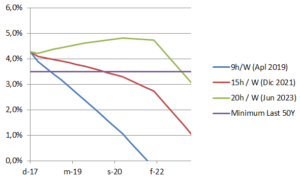 The last one, by Daniel Aaronson, is the trend component of LFP absent cyclical factors. These estimations already consider postponing retirement and therefore longer working life. Actually the BLS (the most pessimistic) with projections of a 1.8% decrease in LFP in the period 2016-2026 is also considering the highest increase in LFP for the age range 62-64 (4.6%) and 65-69 (4.4%). These increases suppose raising the retirement age by 0.9 years between 2016 and 2026, according to our calculation. BLS expects that this increase will be compensated by a decrease in LFP in the age range 16-24 (-2.7%). On the other hand, as Exhibit 8 shows, the most optimistic projections considering a decrease of LFP from 62.8% in June 2017 to 62.4% in Dec 2020. Increase in working hours per employee: more a possibility than a reality. The increase in Labour Force Participation is not the only source that could attend the need of employees. In the USA, there are more than 27MM workers with part time contracts that potentially could increase its working hours and attend the demand of the economy. Unfortunately we do not consider average working hours for full time employment and part time employment separately. Assuming the average number of working hours for full time employment is 40 hours a week the implicit working hours for part time employments would be 8.5 hours a week if we want to get the total working hours of 34.5, that is the last data for May 2018. Increasing the working hours of part time employees from 8.5 to 15 hours a week the total number of working hours would increase from 34.5h to 35.5 hours. That would be enough to attend to the work demand up to 1Q 2019 without significant decrease to the unemployment rate considering the highest labour participation rate of the three estimations shown in Exhibit 8. In this situation in 2Q2021 the unemployment rate could fall below 3.4%, the lowest level in the last 50 years. The aforementioned need to increase working hours (1.1 hours) seems to be a very relevant amount if we compare this figure with the maximum increase in the last decade that has been below 1 hours (see Exhibit 11). In addition, in the case of the USA, we shouldn’t expect a recovery to the level of working hours for part time contracts at the pre-crisis level, as they are already at that level, in both cases close to 9 hours a week. Moreover, as Exhibit 9 shows, the number of hours worked per week has been proven to be very inflexible to the change in unemployment rate. The current value of 34.5 hours with an unemployment rate of 3.8% is very near (34.4h) to the 2011 level, when the unemployment rate was 9%. There are no dates of part time contracts per age of workers but we could suppose that people from 18 to 24 would be dominant in this type of contracts. The total population in the USA in that age range is 30MM, of which 21MM are employed. On the other hand, there are 20MM of university students in the USA. That makes us think that many part time workers are university students, and therefore the increase in the number of weekly working hours are limited by the aforementioned circumstances. In absolute numbers, there are 6.07 MM unemployed people, supposing an unemployment rate in the USA of 3.8%. We could say that many of these 6.07MM unemployed people could represent fictional unemployment, and we think that this level is below the Natural Rate of Unemployment. In this sense, further reduction of the unemployment rate would be at the expense of inflation pressures. Even if we were wrong, making a very optimistic assumption that the Natural Rate of Unemployment could be at the lowest level of unemployment of the last 50 years, the total available employees that could be hired without provoking a rise in inflation would be just 1MM compared with the 8.5 MM new employees that the economy is expected to need before December 2020. We could therefore be certain that currently unemployed people will not be a relevant source of work force in the near future. The maximum in the markets could be August 2018 at the earliest or December 2020 at the latest. 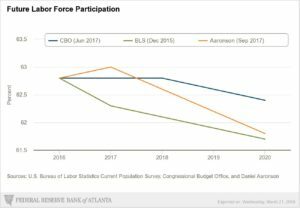 The most optimistic future Labour Force Participation (CBO). If we were to consider any other two more pessimistic estimations, our longest estimation for the downturn would be sooner than June 2019. We considered an increase in the average number of working hours for part time contracts from 9 to 15 hours per week. We think that this estimation is already very optimistic, and increases above that level are very improbable given that many of these part time employees are students with limited time resources. In addition, the current level is very close to the highest that it has been since 2006, the first year that we have dates for. It has been very stable since 2011 and inflexible to variations in the unemployment rate. Considering a more realistic hypothesis of 9 hours for part time contracts per week, our estimation for the time of the maximum of S&P500 index would be before April 2019. We consider that an unemployment rate below 3.5%, the lowest level in fifty years, is also improbable. In line with the last six cycles, we expect the maximum in the S&P500 prices index would take place 6 months after the minimum in the unemployment rate. Although our lower estimation for the unemployment rate is 3.5%, the current level is 3.8% which is almost in line with the lowest level in 50 years. In addition, it is very likely that the unemployment rate could drop below the Natural Rate of Unemployment and so the probability of already reaching the maximum employment in the cycle is considerable. When the unemployment rate is so low, a change in tendency is near to come. As we have already explained, there are many ways to increase the supply of working hours but only two generate less inflation risk: increase in population and reduction of the unemployment rate when it is above the Natural Rate of Unemployment. As we have already explained, in the short and medium term all additional increases of working hours that come from these aforementioned free inflation sources would not be enough to cover the demand and most probably will generate inflation risk. In this sense, it can be assumed that if some employees decide to postpone their retirement, this will be most probably be because they are offered better economic conditions than they had before taking that decision. The same argument could be applied to part time employees that decide extend their working hours per week – shadow workers that decide to accept a working contract, or workers who were thinking of leaving their jobs to attend to family responsibilities and finally decide to remain employed. In any case, if not all of these circumstances will make inflation rise, at least some of them will do and, as we have explained, the job demand is expected to be high enough to need many of these employment sources. This situation is especially dangerous, much more than it was when the unemployment rate was higher. In that situation, the monetary policy did not have to be very precise. If the monetary expansion was too loose there was no problem as there was enough free capacity in the economy to absorb the overstimulated demand provoked by a monetary excess. 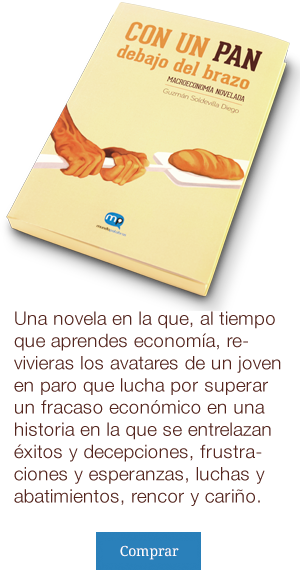 If that situation did not remain too long, the risk could be minimised. But the situation is now completely different. As we have explained above, there are already many inflation forces that will push prices upwards. This situation will be more accused, encouraged by the continuation of working hours demand which will be even stronger with tax reforms and the infrastructure investment plan mentioned in other publications. But now the monetary policy must be very accurate indeed, so much that the need for preciseness is not possible for the nature of the issue. In this sense it is unavoidable that it will fail sooner or later. On the one hand, there is a risk of being too lax that could take inflation out of control and create possible speculative bubbles. On the other hand, there is a risk of a too-tight monetary policy that could excessively repress the economy and provoke a recession. When the unemployment rate is so low, we are right to think that change in the market tendency will come in the near future. In this situation, one of the key variables to watch is inflation, but we will write about this in other report.